Tanning Racks can be used to cure hides and pelts, converting them into leather, and to cut leather into leather strips. In game the animation associated with this action involves a character (NPCs will perform this action also, though there will be no change to their inventories) crouching in front of a tanning rack and using a small knife to scrape a hide. This process is more similar to preparing hides or vellum than actually tanning leather. Leather is unusually heavy, meaning that in nearly all cases leather weighs more than the hides/pelts used to create the leather. Therefore, tanning when near your Carry Weight limit can cause you to be over-encumbered. However, further transforming the leather into leather strips always results in a net decrease in weight. 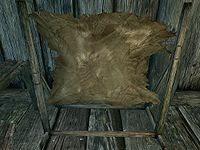 Several pelts -- all varieties of bear pelts as well as Ice Wolf Pelts -- are more valuable originally than after being converted into leather. Even if the leather is further transformed in leather strips, there is still a net decrease in gold value. † Technically, there are two varieties of Deer Hides (2 IDs). However, the two varieties are identical as far as tanning is concerned. Occasionally, when you activate the Tanning Rack, the animation will not start and you will not enter third-person view if you were in first-person view. When this happens, you will instantly crash upon crafting anything. The workaround is to exit the screen, wait a few seconds, and then try again. ? This page was last modified on 3 June 2018, at 18:43.